We provide both photo formats – printed and digital files (for upload). These photographs must be submitted along with an application to Florida Board of Bar Examiners. The administrative agency of the Supreme Court of Florida created specific photo guidelines that must be carefully followed in order to be eligible for admission process. Passport Photo Place specializes in legal photography for documents and cases and provides a same-day photo service that is 100% compliant with the specifications of Florida Board of Bar Examiners admission documentation. Guaranteed Florida BAR picture service. 2. 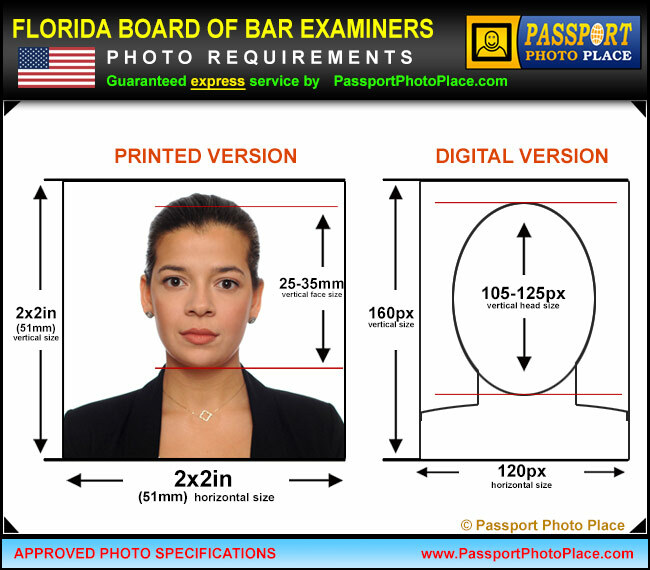 For bar examination photo identification badge, an applicant must upload a digital version of the photograph taken in front of an off-white or light-colored background with final digital JPEG picture file is of at least 120x160px and file size less than 100kb. The digital picture size must be in the format “firstname.lastname.jpg” where “lastname” must match the “Last” form field of Certificate of Admission field. Please wear a solid-colored top/shirt. White or slightly off-white tops are not recommended since the background for FBAR application photos is plain white or off-white and there must be a clear contrast between subject and the background.